Archive of 2010 PNC Info. 12/30/10 - Michael Mules, our club treasurer, reminds those members who still have not paid their 2011 dues, that the deadline is the 1st of January. After that, a late fee applies. A dues renewal form was printed in the November, 2010 issue of Coil Line. 12/29/10 - The topic for the December 29th (Tonight), 9 PM EST PNC3 Chat on the Delphi Message Board will be "New Year's New Collecting Theme...What will you collect in 2011?". If you know someone who is new to Plate Number Coil Collecting, this would be a good place for them to chat with knowledgeable collectors. The chat will be hosted by Michael Mules. Donna Rajotte in Providence advises that the Avery Forever Coils that she currently has are Peak/Valley (P/V) and that she is sold out of the Valley/Peak (V/P) rolls. Consignments for PNC3 Auction #44 are being accepted now until January 20, 2011. 12/22/10 - The January, 2011 issue of Coil Line has been posted. Those members who elected to receive Coil Line electronically will receive the URL soon. This issue contains an Auction Consignment form and the 2010 Index. 12/20/10 - The topic for the December 22nd, 9 PM EST PNC3 Chat on the Delphi Message Board will be "Holiday Wish List... What PNC did you request from Santa?". If you know someone who is new to Plate Number Coil Collecting, this would be a good place for them to chat with knowledgeable collectors. The chat will be hosted by Michael Mules. 12/18/10 - According to the December American Philatelic Society Member Newsletter, "The USPS has indicated they will announce their 2011 stamp schedule on December 27. Details will be In next month's APS e-newsletter. However, we do know there will be two stamps issued at both APS AmeriStamp Expo (Art Deco Bird coil and reissue of the Navajo Necklace) and at the APS StampShow (Flags of Our Nation and a Forever Eid stamp)." 12/6/10 - The topic for the December 8th, 9 PM EST PNC3 Chat on the Delphi Message Board will be "The what, why, and how of PNCs". If you know someone who is new to Plate Number Coil Collecting, this would be a good place for them to chat with knowledgeable collectors. The chat will be hosted by Michael Mules. (.44) Lady Liberty/Flag Forever PSA coil of 100, plate number V111111 every 40 stamps. USPS item number 787900.
number P111111 every 32 stamps. USPS item number 787900.
number S111111 every 32 stamps. USPS item number 787900. Please note that the USPS item numbers above are not the same as "order numbers" when ordering from the 'Cave'. Each of the three coils listed will have a different 'order' number. 11/29/10 - The topic for the December 1st, 9 PM EST PNC3 Chat on the Delphi Message Board will be "New Issues and General Discussion. In what format will you collect the new Forever coils?". The chat will be hosted by Michael Mules. 11/26/10 - The December, 2010 issue of Coil Line has been posted. Those members who elected to receive Coil Line electronically will receive the URL soon. This issue contains the Auction Results and a Shoulder Types Census. Note: We were offline for a week or so because of technical problems. We are in the process of switching to a server that the club has control of. We hope to have everything switched over by the first of January, 2011. Thanks for your patience and understanding. 11/18/10 - On December 1, the USPS is releasing Forever stamps in a coil format for the first time. 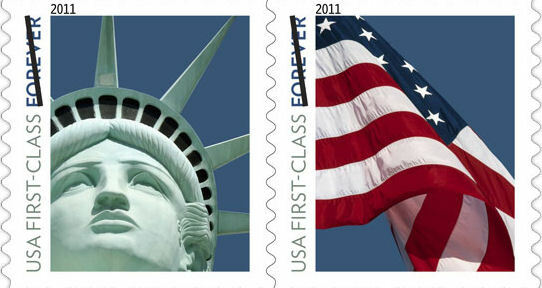 The stamps feature se-tenant Lady Liberty and Flag designs and are being produced by all three printers in self-adhesive rolls of 100. It is reported that the micro-printing will be �4evR� on the Ashton Potter stamps, �4EVER� on the Avery stamps, and �4ver� on the Sennett stamps, instead of �USPS�. 11/8/10 - I've had several confirmed reports of mint examples of plate V333 on the (10c) Banner coil stamp in rolls of 10,000. 10/20/10 - The November, 2010 issue of Coil Line has been posted. Those members who elected to receive Coil Line electronically will receive the URL soon. This issue contains the 2011 Dues Renewal Form. 10/5/10 - The Officers page has been updated with the newly elected officers. I do not have pictures of all of them yet. 9/27/10 - The October, 2010 issue of Coil Line has been posted. Those members who elected to receive Coil Line electronically will receive the URL soon. This issue contains the Autumn Auction listing and a bid sheet. You must be a member to bid in this auction. 9/15/10 - President Gene Trinks has confirmed that he will be attending the regional meeting at SESCAL, which will be held October 1-3 at the Hilton Los Angeles Airport Hotel. The regional meeting will be held on Saturday, October 2, 2010. 7/27/10 - The August, 2010 issue of Coil Line has been posted. Those members who elected to receive Coil Line electronically will receive the URL soon. This issue contains the Election Results. 6/28/10 - The July, 2010 issue of Coil Line has been posted. Those members who elected to receive Coil Line electronically will receive the URL soon. This issue contains the Auction Consignment sheet. Lots must be in the auctioneers possession by July 31, 2010. 5/28/10 - The June, 2010 issue of Coil Line has been posted. Those members who elected to receive Coil Line electronically will receive the URL soon. This issue contains the latest Membership Roster and the Election Ballot. 4/27/10 - The May, 2010 issue of Coil Line has been posted. Those members who elected to receive Coil Line electronically will receive the URL soon. This issue contains the latest Catalog Order Form. 3/25/10 - The April, 2010 issue of Coil Line has been posted. Those members who elected to receive Coil Line electronically will receive the URL soon. This issue contains the latest Catalog Order Form. 3/8/10 - Unfortunately, we had a computer crash and found out that the server had not been backed up for quite a few months. I'll try to reconstruct what I can of what is missing. It will undoubtedly be a slow process. The lots for Auction #42 which ends April 3, 2010, have been posted. You must be a member to bid. Click here for the lot listing and here for a bid sheet. 2/25/10 - The March, 2010 issue of Coil Line was mailed today. 2/19/10 - We are experiencing problems with the web site. We hope to have the problem resolved soon. The March, 2010 issue of Coil Line has been posted. Those members who elected to receive Coil Line electronically will receive the URL soon. This issue contains the listing of lots for Auction #42.